A committee of parishioners, parents and school alumni parents works together to sponsor the annual Golf Outing which takes place at the end of September at Pelham Country Club. This outing is now eleven years old and continues to grow each year. The committee begins to meet in June and new members are always welcome. You do not have to be a golfer to help. 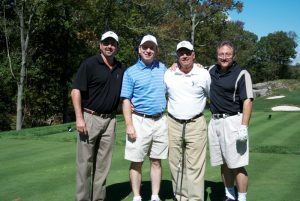 Here are some pics of our recent golf outing. We encourage all parishioners to click the sheep icon so you can sign-up to get important updates from the parish in a timely and convenient way.